Person Responsible: L. De Santis et al. Laura De Santis (Istituto Nazionale di Oceanografia e Geofisica Sperimentale OGS, Trieste, Italy), Tim Naish (Antarctic Research Center, Victoria Univ., Wellington New Zealand), Rob DeConto (University of Massachusetts-Amherst, MA, USA), Carlota Escutia (CSIC -Univ. de Granada, Spain). • PAIS aims to constrain Antarctica’s contribution to sea level, resulting from past changes in ice sheet mass loss and its impacts on environment, atmospheric and oceanic circulation. Based on paleo analysis, PAIS work can bound the estimates of future ice loss, and therefore provide a comprehensive view of our planet’s near-term future. PAIS research has been influential in the Intergovernmenta lPanel on Climate Change IPCC’s AR5 report and is a priority in the current sixth cycle of the IPCC. • Extensive PAIS-facilitated field work on land and at sea has been carried out within the framework of national and multi-national projects, including International Ocean Discovery Program (IODP) (http://iodp.tamu.edu/index.htmlexpedition) 374 in the Ross Sea in early 2018. Internationaland multidisciplinary campaigns yielded new findings into modern and past (last 30-40 million of years) interactions between atmospheric and oceanic circulation and ice sheet-ice shelf dynamics. Intervals studied span a range of timescales from decades to millions of years, from the pre-glacial greenhouse to icehouse climate and into the future. • An international conference held in 2017 in Trieste (Italy), with more than 200 participants from 17 countries, focused on high priority questions relevant to the IPCC (http://ipcc.ch/and) the SCAR Horizon Scan for the next 20 years of Antarctic Research (https://www.scar.org/about-us/view-from-south/). A white paper that will be further discussed and finalised during the Polar 2018 conference, summarizesthe PAIS conference outcomes andoutlines research priorities over the next 4 years of the PAIS program and beyond. 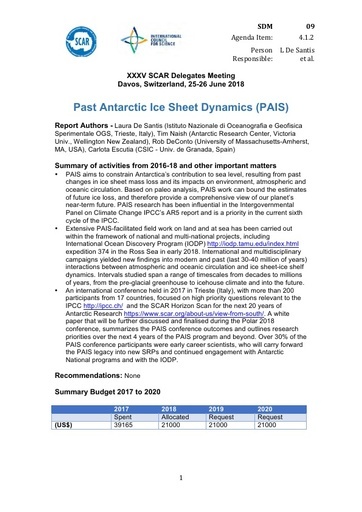 Over 30% of the PAIS conference participants were early career scientists, who will carry forward the PAIS legacy into new SRPs and continued engagement with Antarctic National programs and with the IODP.